A good job can’t be measured just by a punch clock. Today, work is a dynamic concept requiring a workforce adaptable to changing market forces, technology, and societal needs. Trends are emerging that are prompting the need for fresh approaches to workforce development. Over the last 10 years, Pennsylvania has seen careers in science, technology, engineering, and math (STEM) fields exceeding the growth of other types of occupations. By 2026, there will be nearly 600,000 job openings in Pennsylvania, with STEM jobs growing at over nine percent. How will Pennsylvania’s workforce rise to the occasion and meet this rapidly growing demand for a skilled workforce, and what can the commonwealth do to help labor and industry make that happen? PAsmart is the answer. A new initiative created by Gov. Tom Wolf, PAsmart is a multipronged, inclusive approach to ensuring Pennsylvania has the most prepared, talented, and skilled workforce in the country. By helping public programs and initiatives to work in a smarter, more coordinated way, PAsmart empowers all Pennsylvanians to develop the skills and knowledge they need to train for the quality jobs they want while also helping businesses address complex workforce challenges. PAsmart is dedicated to enabling every Pennsylvanian to succeed, with resources for workers with disabilities, veterans, adults or returning students, and individuals looking to take their skillset to the next level for future opportunities. 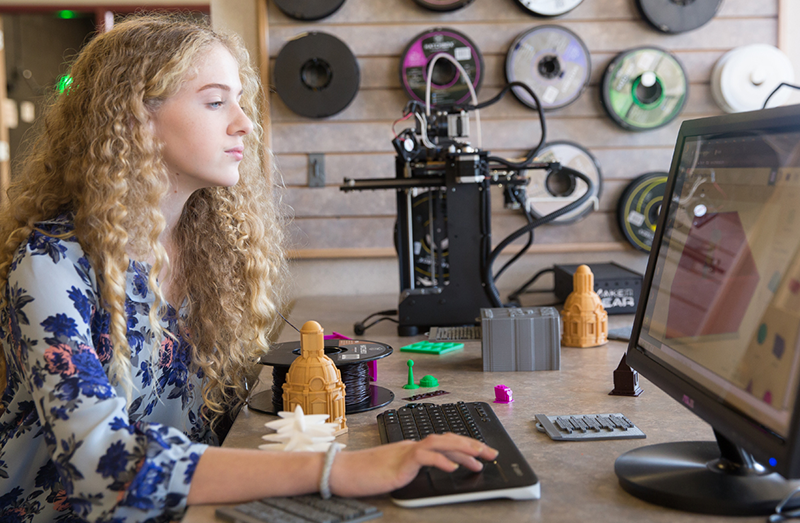 PAsmart is currently providing $30 million in grants to strengthen K-12 STEM and computer science education, expand registered apprenticeships, and support job training and Industry Partnership programs. This funding is targeted to support economic growth, education, training, government collaboration, and alignment of key resources. Wish you knew which jobs are in-demand, what a day in a specific job looks like, which of your skills are in high demand, or what job preparation resources are available to veterans and those with disabilities? Visit the Discover New Career Paths section to learn about up-and-coming careers, how to transition from military service to a career, local centers that will help you with interview prep, skills analysis tools, and other helpful resources to get you started on the path to your next career. Pennsylvania is home to world-renowned educational institutions — nearly 250 of them! That means you have your pick of programs, whether you’re getting an advanced degree, entering a new field, or a soon-to-be graduate exploring your options. Check out the Explore Education section to see which programs are available. Pennsylvania is committed to ensuring everyone can pursue a quality education, so make sure you check out the available financial aid programs that can help ease the financial burden of pursuing your dream. Traditional education isn’t the only way to gain valuable knowledge and skills — hands-on training and apprenticeships are a great way to prepare yourself for a career or to make sure you’re equipped to handle the evolving needs of your current field. Visit the Find Training & Apprenticeships section to see what apprenticeships or on-the-job training are available near you, and how you can benefit from enrolling. Are you a business owner interested in establishing a training program or connecting with existing initiatives in your area? Check out our Employee Training Programs for resources that help business owners who want to ensure their quality workforce continues to grow with their business. We know there’s no one-size-fits-all approach to developing new skills or choosing a career path, which is why PAsmart is making diverse, dedicated investments in education, workforce training programs, apprenticeships, industry partnerships, and new online tools and resources. Ready to find your own path to success? Visit the PAsmart website today to take the first step toward achieving your career goals. PAsmart.gov is the go-to resource for students, jobseekers, and workers to learn about new career opportunities, skill and training programs and helpful resources for getting the job of today and learning the skills of tomorrow. PAsmart is focused on ensuring Pennsylvania students and workers have the skills and abilities to meet the economic needs of the 21st century. Stay up-to-date on all our #PAsmart news and follow us on Facebook, Twitter, and LinkedIn. Jerry Oleksiak is the secretary of the Pennsylvania Department of Labor & Industry (L&I). Before joining L&I, Jerry served in several positions with the Pennsylvania State Education Association (PSEA), including treasurer, vice president, and president. Prior to that he spent over thirty years as a classroom teacher, primarily in the field of special education.